The May Art Walk in Torrington is taking place on May 1 and Karen Rossi Studios http://www.karenrossi.com is featuring her collaborations with Dawn Hill of unique handmade jewelry and an installation of Fairy Houses in her 27 East Main Street windows. 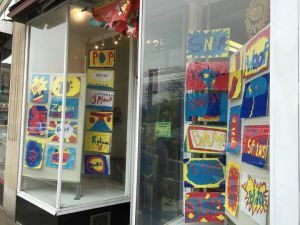 Also on display in the windows of Karen Rossi Studios is the exciting work of some talented young artists. 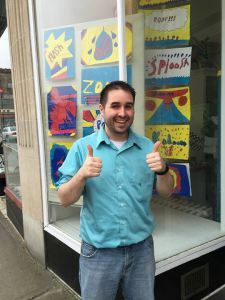 Mr. Preato’s 5th grade students from East School produced an exciting collection of artwork on display in the windows of Karen Rossi Studios at 27 East Main Street, Torrington, CT. The masterpieces are inspired by the Pop Art Movement, and display words that look like the sound. For instance “Splash” depicts drops exploding off the paper, and Zap is portrayed in a variety of manners, most alluding to en electrical arc. All the images are painted in primary colors with a vibrant effect.